Bob Marley sings, “One good thing about music—when it hits you, you feel no pain.” Although this may be the case for some people and in some circumstances, we dispute this statement as a global truth. After all, couldn’t any phenomenon commanding enough to alleviate human pain (ostensibly instantaneously) also harbor the potential to catalyze undesirable, even injurious, effects? And couldn’t this influence then logically extend to music employed within the context of a therapeutic process? As music therapist and Concordia University Associate Professor Dr. Laurel Young writes, “the ‘miraculous’ effects of music as featured in popular media along with the widely accepted notion that music is a ‘universal’ medium can lead to false generalizations and over-simplification of how music can and should be used in healthcare or other psychosocial contexts.” One possible manifestation of this oversimplification is to view music as a noninvasive and wholly-positive cure-all, and thus disregard the potential risks associated with music engagement. All therapeutic encounters carry possible risks. In fact, a certain level of risk-taking is necessary for any significant and enduring change to occur. And so, all therapists need a detailed understanding of relevant risks in order to discern the optimal risk-benefit ratio for the people who enlist their services. 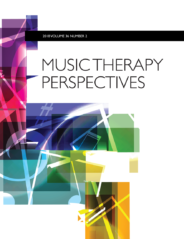 The potential risks of music therapy vary according to the type of music experience, or method, employed. Depending on clients’ needs, they may be invited to improvise, perform, compose, or listen and respond to music. Music therapists must not only understand the inherent benefits of these various methods, but also the unique risks associated with each. Improvising is making up music on the spot. 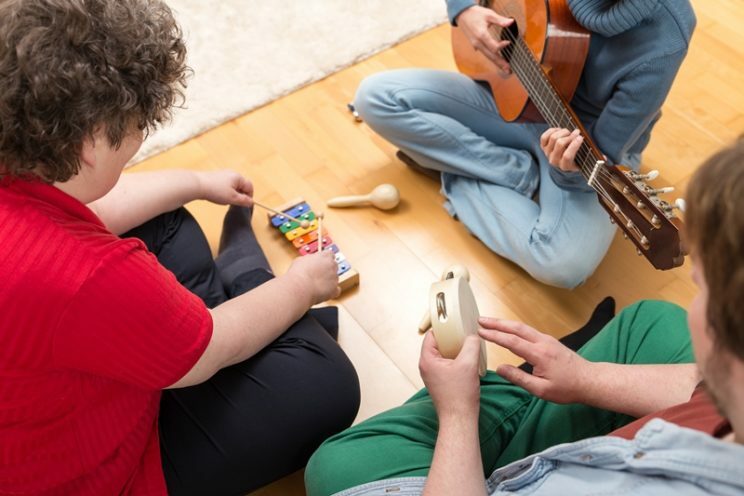 Whereas improvising on percussion instruments in a group session may promote a sense of cohesion among adults seeking mental health treatment, for people whose connection with reality is tenuous, repetitive rhythmic sounds hold the potential to evoke psychotic reactions. And, while improvising with their voices, clients may experience various levels of emotionally-charged self-consciousness. Beyond embarrassment from using their voices and words in this expository way, the experience may evoke long-buried, unconscious memories and associations of an unpleasant or even traumatizing nature. Image credit: “three persons playing sundry instruments at home” by Miriam Doerr Martin Frommherz. Royalty free via Shutterstock. When clients engage in performing pre-composed music, such as a group of high school students with intellectual disabilities who learn and rehearse a piece on the tone chimes, they may feel a sense of pride in their musical accomplishments. However, they may also experience intense anxiety, dissatisfaction, and humiliation if the musical parts do not fit together as anticipated during the school assembly. As an abused teen works with a therapist while composing an original song or instrumental piece, the energies brought to bear through musical tensions and resolutions, or the moods evoked by the sonic qualities of certain instruments, may be incongruous with the client’s lyrics. This may distort rather than clarify the client’s inner experiences, which could complicate the therapeutic process. Finally, risks inherent to a music listening experience may include overstimulation and confusion. This would be a relevant consideration for a person who has sustained a brain injury or who has a neurologic disorder that impacts their ability to make meaning of sensory input. And, while a listener takes in music to guide their movement schemes, as when dancing for self-expression or the release of stress, there is always the risk of physical injury. A primary responsibility of the music therapist is to intentionally design and facilitate all four methods and their innumerable variations to support clients as they face life’s trials, identify new options for acting, and build on personal and collective capacities toward enhanced health and wellbeing. Additionally, it is the therapist’s ethical duty to consider carefully the possible risks intrinsic to each type of music experience and to share this knowledge with the client as appropriate, with the ultimate aim of protecting their safety and promoting their agency in the therapeutic process. Featured image credit: “a group of musical instruments including a guitar, drum, and keyboard” by Brian Goodman. Royalty free via Shutterstock. James Hiller, PhD, MT-BC is Assistant Professor of Music Therapy at the University of Dayton. Jim’s publications include theories supporting music therapy practice, research epistemologies, clinical improvisation, music and emotion, and music therapy education and training. Susan C. Gardstrom, PhD, MT-BC, is professor of music therapy at the University of Dayton, where she has taught since 1998. She has worked with adjudicated adolescents, children with special needs, and people with addictions. She is widely published and has presented in the USA and abroad.